Elevate this dish from ordinary to extraordinary with one of our delicious gourmet foods. Salad Vinaigrette: In a small saucepan, reduce (over high heat) the fresh orange juice, lime juice, and citrus zest to 1/4 cup. The mixture should be thick and syrupy. Pour mixture in medium bowl, add mustard, honey, and rice wine vinegar. Whisk to blend. Stir vigorously and slowly drizzle olive oil into the bowl as you whisk. Set vinaigrette aside as you prepare the salad. 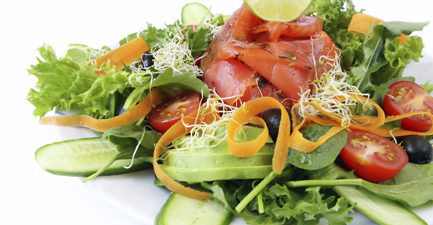 Salad: In a large bowl combine lettuce, cucumber slices, avocado slices, bean sprouts, tomatoes, and carrots. Toss with vinaigrette and season with salt and pepper. Make sure all is well mixed. Place salad on plates. Arrange 2 oz. of salmon on each of 4 salads. Serve immediately.